A dessert with ice cream in the title, but no ice cream involved?! Some might say blasphemy, but I say amazing! I’ll tell you, I was quite surprised at how much I liked this creation, but honestly, how could you go wrong! Jess’s favorite cake is confetti style so it only made sense to fill up our ice cream cones with that cake batter. She also loves sprinkles so we went all out, using two different types. 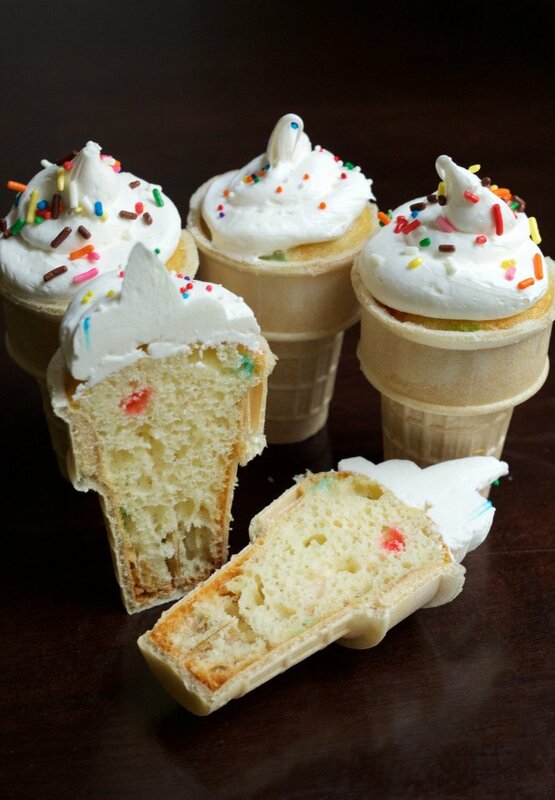 You can really use whatever cake and icing mix you want, even mixing batters throughout the cone if you want! It’s so easy, delicious, and fun! Take your aluminum pan and turn it upside down. Place one of the ice cream cones on the pan and trace it 12 times evenly around the pan with a sharpie or marker you have lying around. Cut out the holes with a sharp knife or box cutter. 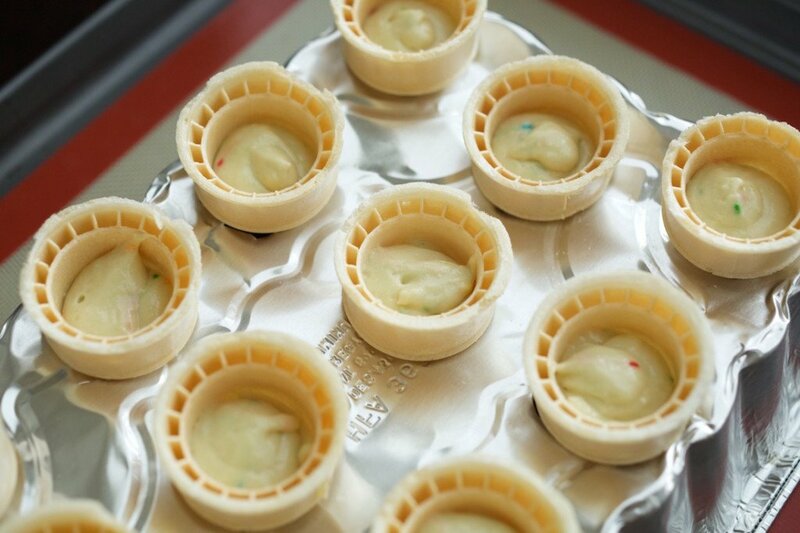 Place 12 ice cream cones in the pan and place the whole thing on a baking sheet. Prepare your confetti cake mix per the instructions on the box. Pour the mix into a plastic bag and cut off one of the corners. Squeeze the mix into each cone, filling the cone almost to the top. You want to leave a little bit of room for the cake to rise in the cone without overflowing too much. I left about a ½ in exposed cone. Place your cones in the oven for about 18-20 min or whatever it says on the back of the box for cupcakes. You want the tops of the cupcakes to be golden brown. After the cupcakes are baked, take them out of the oven and let cool. Once the cupcakes are cooled completely, put your icing in another plastic bag and cut off a corner. 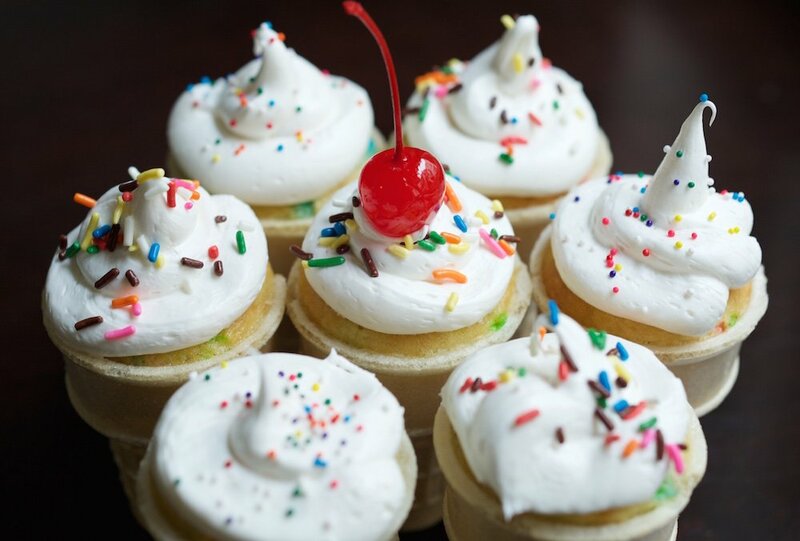 Squeeze the icing on top of the cupcakes in a swirl fashion.